Generally, it’s a great day for any gamer parent when the offspring say “I want to play this one!” Problems arise when “this one” is a game like Scythe, where the rules might just be a bit too much for an elementary school kid and you really want to keep them ignorant of the whole giant war robot thing until they come stomping by the house a year or two down the line. But little Suzy and Timmy are really insistent. Well, that problem was tidily solved by Hoby and Vienna Chou. My Little Scythe has all the essentials of big Scythe, but trimmed down to a level of complexity that is perfect to play with the wee ones. That isn’t to say My Little Scythe is simplistic or even boring, but being able to explain a game in ten minutes or less is generally a good thing for a family game. The setting is also more family suitable. 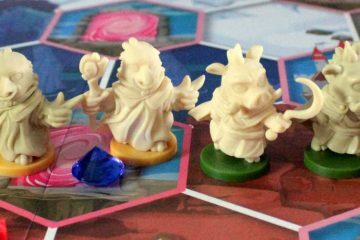 Instead of the alternate history 1920 steampunk socialism My Little Scythe takes place in the beautiful Kingdom of Pomme, where animals from the six other kingdoms compete in a friendly tournament to find who will be King or Queen of Pomme for the next year.